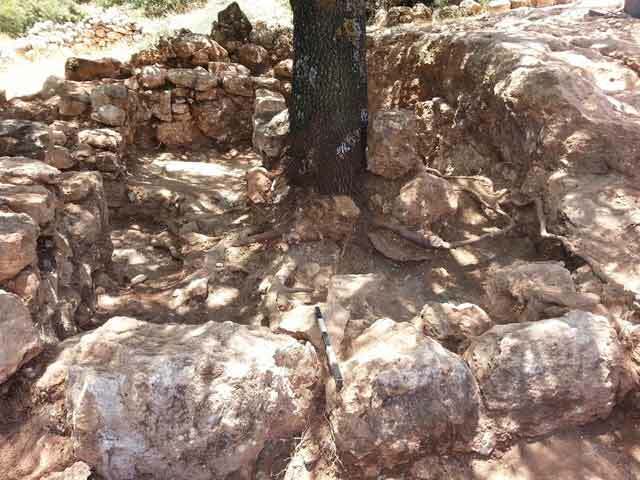 In June 2014, a salvage excavation was conducted in the ruins of en-Nabi Yusha‘ village (النبي يوشع), southeast of Yesha‘ Junction and near Koah Fortress (Yesha‘ Fortress; Permit No. A-7126; map ref. 252314/779860; Fig. 1), after having sustained damage during the construction of a road parallel to Road 899. The excavation, on behalf of the Israel Antiquities Authority, was directed by U. Berger, with the assistance of Y. Ya‘aqobi (administration), R. Liran, R. Mishayev and M. Kahan (surveying and drafting), K. Tal Smith (photography), H. Tahan-Rosen (pottery drawing), L. Porat (pottery restoration) and a group of laborers from Majd el-Krum. Special thanks to K. Kehat (Ha-Re‘ut Museum) and A. Rosler (ABUS Company). 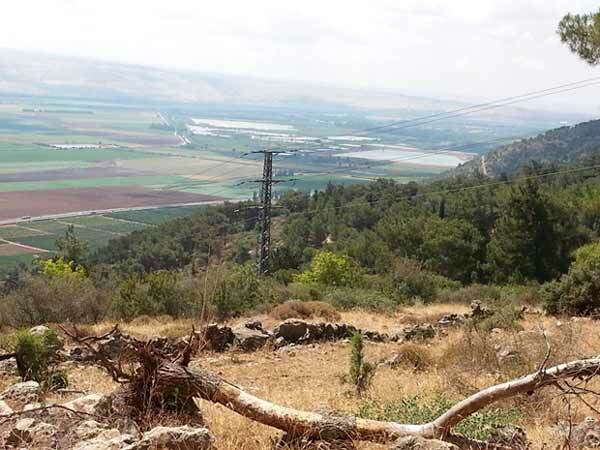 The village is situated on the Naftali mountain ridge (c. 375 m asl), along the ancient mountain road that led from Safed to Lebanon, overlooking the Hula Valley. En-Nabi Yusha‘ was a Shiite-Metawali village that was abandoned after the Palmach conquered it during Operation Yiftah in May 1948. 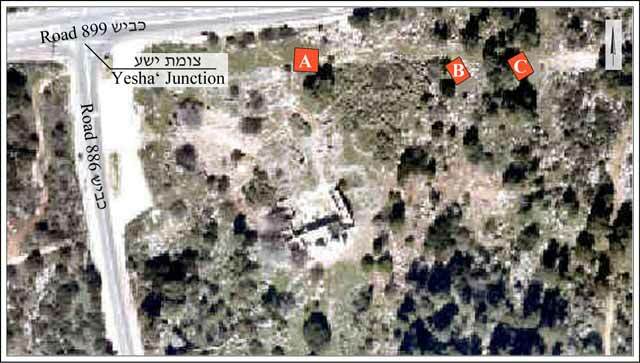 All of the buildings in the village were destroyed apart from the Tomb of Nabi Yusha‘ (the prophet Joshua son of Nun, according to the Muslim tradition), which is a burial structure with two large concrete domes. 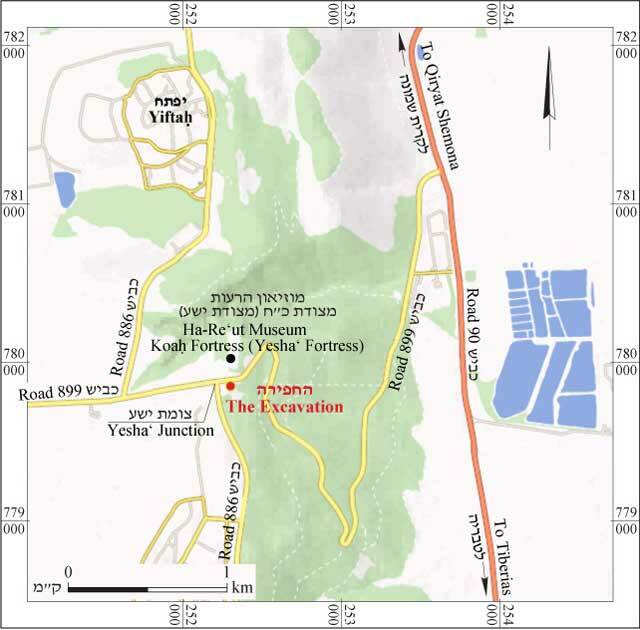 The site was first surveyed by Victor Guérin (1880:362) on his way from the Hula Valley to Tell Qadesh, and he documented the local traditions regarding the location of Joshua son of Nun’s tomb. The village of en-Nabi Yusha‘ appears on the maps of the Survey of Western Palestine, and is briefly described, noting the traditions of the inhabitants (Conder and Kitchener 1881:228; Palmer 1881:113). A 1966 emergency survey conducted in the village on behalf of the Department of Antiquities (Ronen A., Survey Report–Nabi Yusha‘, IAA archive, 1966) concluded with the recommendation to perform “a meticulous architectural survey” at the site; his advice, however, was not accepted. In 1994, an architectural survey was conducted on behalf of the Council for British Research in the Levant, which focused exclusively on the structure of the tomb (Petersen 2001). The current excavation is the first to be carried out at the site. 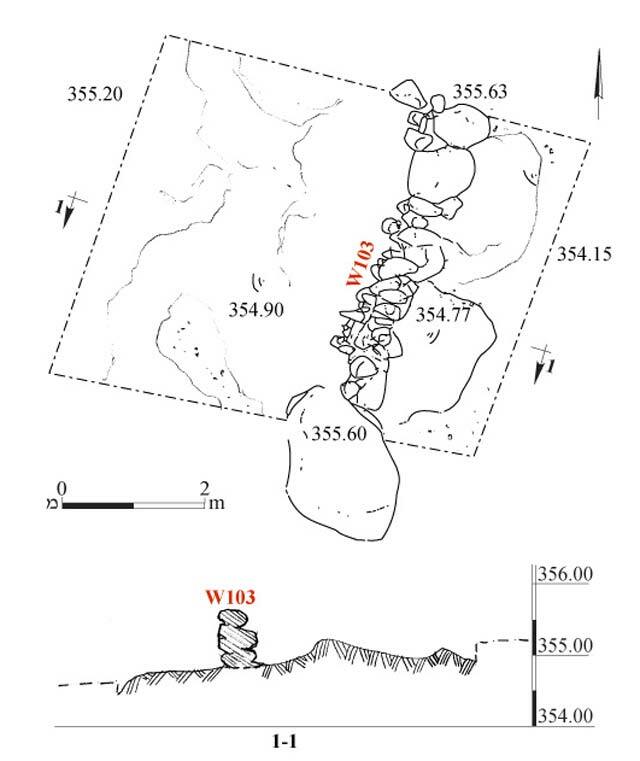 The excavation (100 sq m) was conducted in three locations (Areas A–C; Fig. 2) along the line of damage in the northern part of the site. The village’s perimeter fence, agricultural terraces, terrace walls and remains of a stone building dating to the time of the British Mandate were exposed. 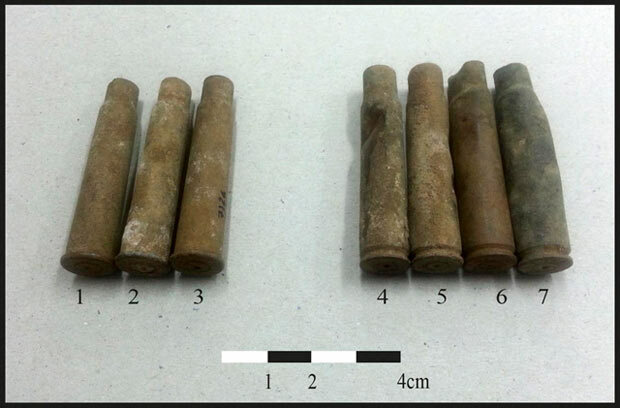 In addition, rifle cartridges and pieces of shells and shrapnel were discovered, which are evidence of the three fierce battles waged there in April and May 1948 (Dekel 2006:43–65). Area A (Fig. 3). A rectangular dwelling (3.5 × 5.0 m) was exposed beneath the heaps of rubble, collapsed stones and accumulations of the past 66 years. A terebinth tree, some seventy years old, grows in the midst of the building (Fig. 4). Over time the tree has become sacred because of its proximity to the prophet’s tomb, as evidenced by the pieces of cloth and ribbons tied to its branches—a popular belief associated with the granting of wishes. The dwelling consisted of a single room with a lateral arch that supported the roof. The stone arch was located in the rubble (L110); only its western pillar (W117) and a single course of its eastern pillar (part of W119) survived. The building was founded on the hewn and leveled calcareous bedrock, which made up most of the northwestern wall and served as the foundation for the northeastern wall (W119), for the southwestern wall (W109) and for the plaster floor (L123). The walls (preserved height 1.0–1.1 m) were built of a combination of fieldstones, coarsely hewn stones and well-dressed ashlars; plaster remains adhering to the walls are still visible. The thick roots of the tree had damaged the floor and other parts of the structure. An opening in the center of the southeastern wall (W107) served as the entrance to the building. The stone lintel, doorjambs and threshold stones were fashioned from soft, carefully dressed limestone. A small semicircular entryway (L122) at the front of the structure was paved with stone slabs. It was bordered on its outside by threshold stones and along the inside by a fieldstone-built step. The elevation of the entryway was 0.2 m below that of the house, and most of the artifacts were found there. Wooden beams of the door and several functional and decorative metal items that were fastened to the door were discovered in the accumulation (L121) that sealed the floor of the entryway. Most of the pottery discovered in the building was from the ceramic workshops of Rashaya el-Fukhar in southern Lebanon—vessels decorated with colored lines and geometric patterns, including fragments of several storage jars of various sizes and bearing various decorations (Fig. 5); a chamber pot (Fig. 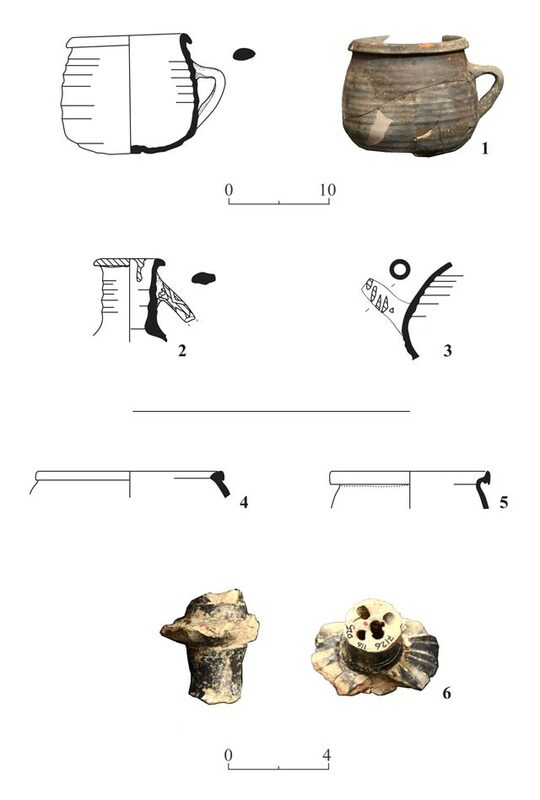 6:1); fragments of spouted drinking jugs (ibriks; Fig. 6:2, 3), fragments of mustard yellow glazed bowls imported from southwestern Europe (Fig. 6:4, 5) and the top of a black glazed narghile decorated with a floral motif (Fig. 6:6). A saj used in baking was discovered in the northeastern part of the house, beside clusters of charcoal and tin cans. In the southwestern part of the dwelling, a number of items were found: a decorated button, a lice comb made of bone (Fig. 7:1), a plastic toothbrush (Fig. 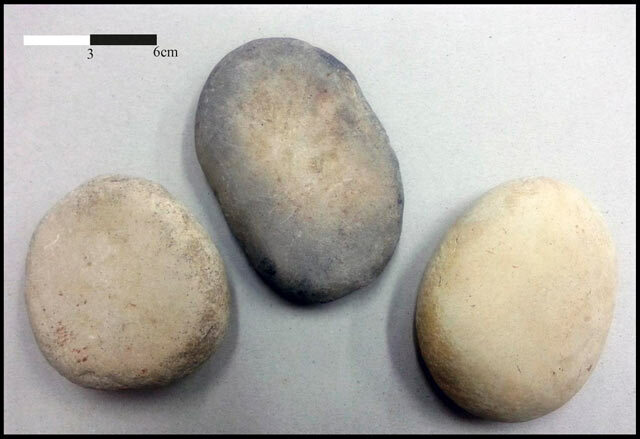 7:2), shoe soles, fragments of glass jars and three polishing stones—pebbles used to burnish the plaster on the walls of the home (Fig. 8). Other artifacts recovered from among the ruins of the building included bullet cartridges that were fired from Lee-Enfield (Fig. 9:1–3) and Mauser (Fig. 9:4–7) rifles used by the Palmach fighters during the battles to take control of the nearby fortress. 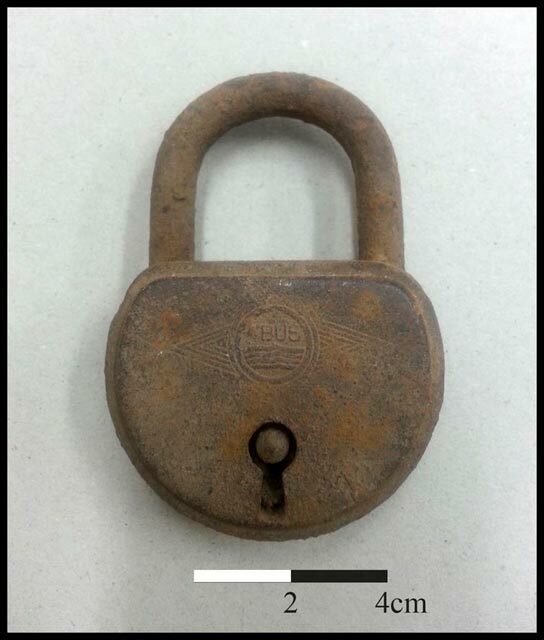 Another historical find, recovered from topsoil, is a lock manufactured by the ABUS Company in Germany (Fig. 10), dating to the late 1940s. Area B (Fig. 11). 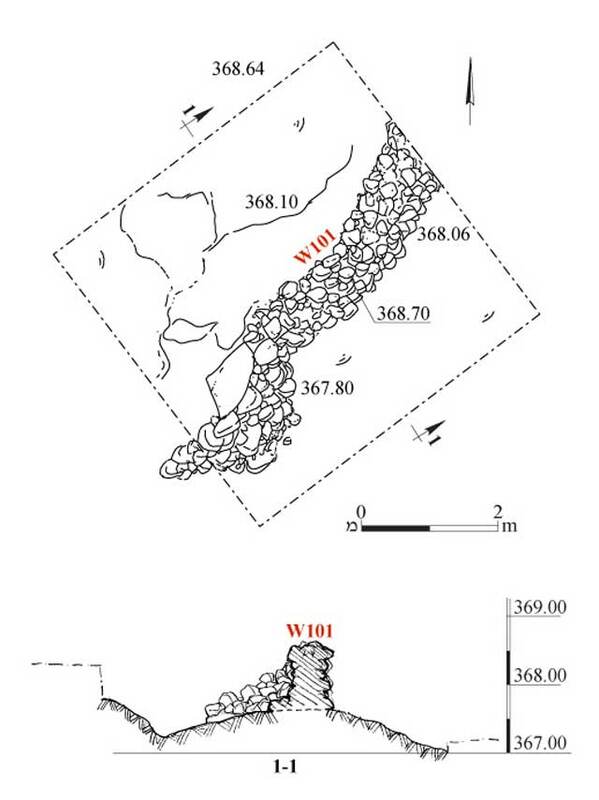 A long field wall (W101) running in a north–south direction was identified in the village’s agricultural area on the eastern slopes of the ridge; an excavation square was opened on either side of it, near the spot where the site had been damaged. The wall was built of fieldstones of various seizes and was used to retain an agricultural terrace. The nature of the soil that had accumulated west of the wall (max. depth 0.5 m) and the ceramic finds that were discovered in it indicate that the terrace was built and used in the Ottoman period at the earliest. Area C (Figs. 12, 13). Here too, the excavation square was opened on either side of a long field wall (W103) that extended in a north–south direction, near the damage that was caused to the site. The wall was also built of fieldstones and was meant to prevent soil erosion (depth c. 0.3 m). This wall served as part of the perimeter enclosure around the settlement; it continued for a distance of c. 40 m along a north–south route, and it evidently formed a corner with a wall that ran along an east–west route and continued up the slope. This wall constituted a partition between the settlement and its agricultural areas, on the one hand, and a small cemetery to its south—one of two known cemeteries at the site. Here too, as on the agricultural terrace in Area B, no items were found that predate the Ottoman period. This excavation sheds some light on the material culture of the residents of en-Nabi Yusha‘ at the end of the British Mandate, and it affords us a glimpse at what was left behind by some of the inhabitants of this small village, which was abandoned at the outbreak of hostilities in the spring of 1948. Dekel Y. 2006. Metzudat Koach–Comraderie Under Fire. Jerusalem (Hebrew). Guérin V. 1880. Description géographique, historique et archéologique de la Palestine III: Galilée II. Paris. Palmer E.H. 1881. The Survey of Western Palestine: Arabic and English Name Lists Collected during the Survey. London. Petersen A. 2001. A Gazetteer of Buildings in Muslim Palestine (British Academy Monographs in Archaeology). Oxford. 2. The location of the excavation areas, aerial view, looking north. 3. Square A, plan and sections. 4. Square A, a saj between the roots of the terebinth tree, looking southwest. 5. 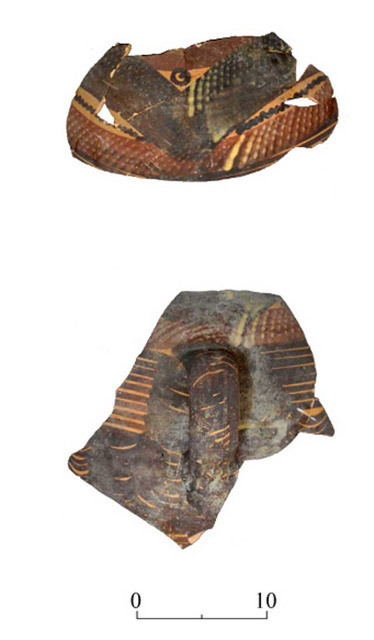 Fragments of a decorated jar. 7. 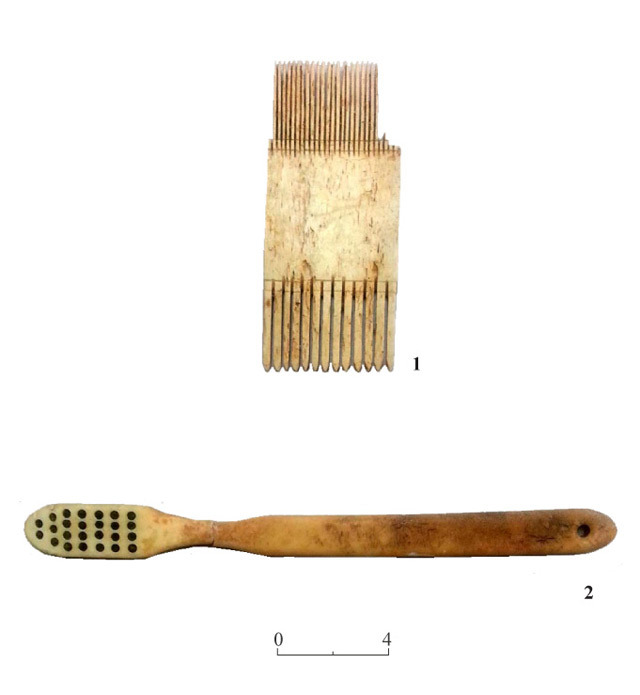 A lice comb and a toothbrush. 11. Square B, plan and section. 12. Square C, looking southeast toward the Hula Valley and the Golan Heights. 13. Square C, plan and section.